This one turned out to be a critical drawing. I hope it is not too much encrypted. Aw crap! This one's too deep for me. Darn! 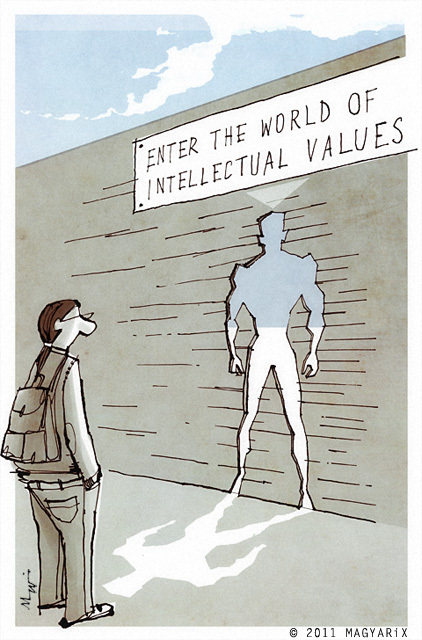 Heh heh - looks like Arnie is the gatekeeper for the land of Intellectual values... nice one. Yes, it is too complicated, too deep, etc. In a "perfect" world, there is an "imperfect" guy looking for a different world, where inner values count... but it looks like the entering of it needs perfect outer values. Endless loop see loop endless.